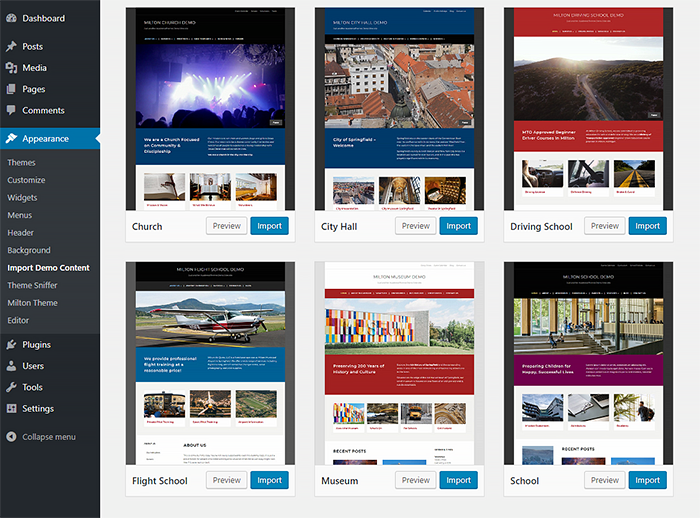 Our most recent themes – Bradbury, Fleming, City Hall, Museo and Milton – have been updated with a better Demo Content Import process. If we have more than one demo for the theme, then clients can now import any of them directly from the backend. This is what the improved demo importer looks in our newest Milton WordPress theme. All it takes is to click the Import button for your demo of choice. Depending on your hosting’s speed, it will take 30-90 seconds for the process to finish. After that you will have a complete replica of our live demo, including the menus, widgets, theme settings and customization (fonts/colors). The only exception are the pages and widgets from third-party plugins, if any are present in the live demo. Hopefully our theme users will now have an even easier time to get started. Dumitru Brinzan is a web developer based in Germany. Dumitru switched to WordPress in 2010 and has been creating WordPress themes since then. From niche themes to general interest themes, Dumitru focuses on usability and accessibility. You can find @Dumitru on Twitter. We create easy to use WordPress for schools, kindergartens, universities, colleges, churches, nonprofit organizations, city halls, local governments, etc. WCAG 2.0 - ISO/IEC 40500 compliant, easy to use on mobile (responsive) and easy to customize.